This may seem an odd thing to say, but I recently discovered that my novel, “Chrissie Warren: Pirate Hunter,” is a better book than I thought it was – and I thought it was pretty damn good. Last month when we were at the Jambalaya Writers Conference, one of the presenters mentioned a book that he had found very useful in plotting. It’s “Save the Cat,” by Blake Snyder. It’s about writing screenplays, not novels, but there’s an awful lot of good advice about story and how to make it work that can be applied to novels. “Save the Cat” is a rather calculated view, one might even say cynical. It’s not about just writing a movie, or even a “great movie,” whatever that is. It’s about how to write a successful movie, successful by Hollywood standards. But there’s a lot of craft that goes into making a successful movie, and what’s wrong with commercial success? There’s a lot to be said for a movie that people want to see. You, as a writer, have a story to tell. Don’t you want to tell it to as many people as you can? You may rebel at the notion of there being rules. You, after all, are an artist. Rules don’t apply to artists. Snyder acknowledges this and says you can write any kind of story you want, any way you want. But if you want it to have success in the marketplace, you have to recognize there are things that work and things that don’t. At the very least, you ought to have an idea what the rules are, so you can enjoy breaking them all the more. But if you don’t understand why they work, you aren’t doing yourself any favor. Anyway, that’s the gist of “Save the Cat,” (Save the Cat, by the way, is one of his rules for screenplay writing and it’s a good one. But it’s not what I’m writing about here. Buy the book.) A lot of what he has to say about screen writing applies equally to writing novels. It’s all about finding the most effective way to tell a story. In talking about structure, Snyder says the opening scene and image are the first taste the audience (or reader) gets in discovering the world you’ve created. It’s usually a glimpse of that world before the chaos of the story knocks it all apart. And the ending scene, after the story has been resolved, shows a glimpse of the new world going forward, how the character and the world have been changed by the action that has taken place. (And if there is no change, there is no story. That’s maybe the most important thing to remember as a writer, whatever your medium.) So the opening and closing scene are sort of a question and answer, telling the reader in shorthand what the story is about. 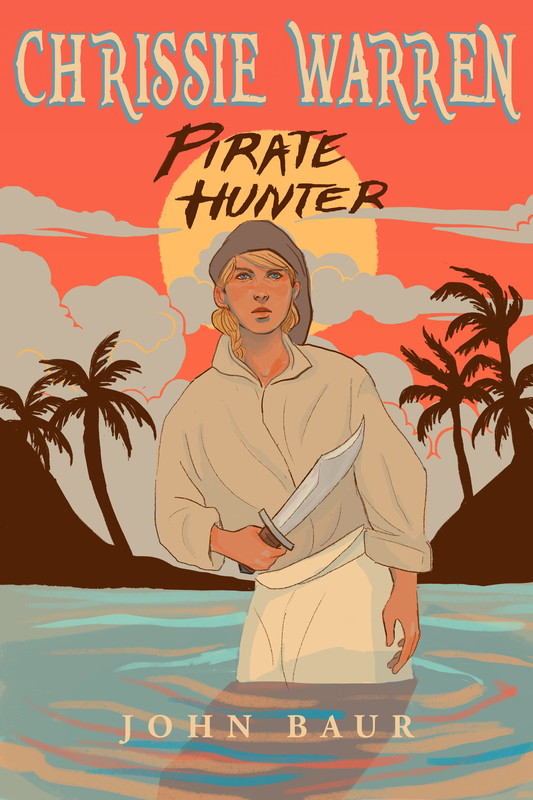 And if you have read “Chrissie Warren: Pirate Hunter” (and if you haven’t, why not?) you may recall that I have those bookends, although I never thought about it that way at the time or did it on purpose. Both the opening and closing scenes take place at a table. In the first scene Chrissie is with her family in Hampton, Va., celebrating her 13th birthday. “She’s become a woman!” her father exults. The final scene takes place at a table in Roadtown, Tortola. Chrissie is surrounded by the family she’s created at sea. And when she says she needs to get into a pair of honest trousers because the dress she’s forced to wear is driving her crazy, Charlie slaps her on the back and says … Well, he says what he says. Don’t want any more spoilers than that. When I wrote it, I thought it was a good line. I didn’t realize at the time it wasn’t just a good line. It was a summing up of what story is about. Now, I had never heard of the notion of the bookend scenes. Wasn’t aware that’s what I had done. But I sure did. The opening and closing scenes are perfect bookends, the closing scene echoes the opening scene in a way I had never even thought about, they are mirror images, neatly encapsulating the the change Chrissie has undergone through her voyage. It’s not anything readers will notice, hell, I didn’t and I wrote the darn thing. Maybe one in ten thousand would get it, and that one’s probably a college English major. (And oh, please, may I have ten thousand readers. Please.) But it really makes the story work, it’s the cap that makes you sit back with a sigh of contentment, even if you aren’t really aware of the technical thing that brought about that feeling of completeness. In retrospect, I can’t think of any other way the story could have ended that would have worked as well. Something to think about. NOT, I would add, to obsess about. Trying to force a story into a formula isn’t going to feel right. But at the very least, when you’re writing you should keep in mind “what is this story about?” and focus on taking the reader along on your main character’s journey. A journey has a beginning and an end, and those opening and closing scenes are your chance to make that journey complete and memorable. Serendipity today. I thought I was done with the subject of flogging – I mean – promoting your book, when this came in the mail. The Writer magazine has a monthly feature, “Where in the World is The Writer?” It’s just a little thing in the front of the book where people send pix of them reading the magazine in various locales – along the Nile, on a ski slope, top of the Empire State Building, that kind of thing. At the start of the summer we were in Florida for vacation and we brought a copy of the magazine with us. Tori got a picture of me and Max (on the left) perusing the magazine with some of the local freebooters at the Billy Bowlegs Pirate Festival. The October issue came out today, and there it was in all its glory! How could they resist? You just can’t resist pirates, am I right? This is called: Playing All the Angles. You might not looking putting yourself forward, but you’ve gotta take every chance you can to get attention to your work. Of course, it helps if you’re a pirate! We all have our regular websites and blogs that we visit as part of our morning routine. Sort of like reading the morning paper over your bowl of corn flakes, only now the morning paper is a news feed and the paper has no paper, just electrons glowing on your computer screen. If you’re a writer, you probably follow several blogs by other writers. One that I highly recommend is the Killzone. It’s a dozen mystery writers who take turns posting tips on the craft, and while it’s sort of geared toward that genre, the advice is usually applicable to writing in general. I don’t write mysteries, but I’ve gotten a lot out of the site, especially when it’s Joseph Scott Bell’s or Joe Moore’s turn in the biweekly rotation. Bell is a very successful writer who also teaches the craft at workshops and in many excellent books. He often talks about how to make it as a writer (the long tail, is how he puts it.) And Moore has good advice on both writing and life, and he’s a funny guy. In fact, I was prompted to mention this today because of Moore’s post this morning, which dovetailed indirectly with my post yesterday. I was talking about the travails of selling your book, and how you have to be willing to get out there. This is hard for a lot of writers because so many of us became writers specifically so that we could have a way to express ourselves creatively without having to deal with all those – you know – people. Moore talked today about “dressing for success.” Not sartorially, but about how acting successful can lead to success. Anyway, it’s a good post. You can read it here. Another thing I like about the site is that when you post a comment, whoever’s turn it was to write that day usually responds, sometimes surprisingly quickly. The Killzone is a great place for advice and inspiration from people who have already achieved what we’re all after – success as writers. And they’re taking the time to give back. When I say we’ve been poring over every word of “Chrissie Warren: Pirate Hunter,” over and over, I really mean it. This photo shows the detritus from the latest, and final, round. Fortunately, what we’re seeing in this last go-round is minor, a missing space here or there. Tiny stuff. And we laughed every time something was found. “Got another one!” my wife, Tori, will say. I’ll pretend to groan, although really I’m relieved as I go in and root it out. One less thing to annoy a reader. Writers, especially writers who are about to self-publish, are encouraged to hire editors. Sometimes it’s just for copy editing, or line editing as it’s called in the publishing world, sometimes it’s someone to take a look at the story and plotting and make suggested revisions. Those can be very helpful. Hiring an editor is a very good idea. First, I’m an editor. I’ve made my living as a news writer and editor all my adult life. News editing and the kind of editing a novel needs are different. My novel is NOT written in AP Style, which has been my Bible for more than 30 years. But I know my way around a sentence and can pick the flaws out of bad grammar better than most people I know. Those of my acquaintance who are better at it are almost all newspaper copy editors. Still, I am not denigrating the value of a good editor. When my friend Mark Summers and I had our book, “Pirattitude,” published by New American Library, our draft was turned over to an in-house editor, Cherilyn Johnson. The poor woman was really good at her job, and didn’t know what to make of us. She sent sent us reams of questions and suggested corrections, stuff that had never even occurred to us. After all, we made up a bunch of the “facts” and words, starting with the title, so line edits and fact checking seemed sort of superfluous. For instance, she really wanted us to come up with a consistent, standardized spelling for “Aarrr!” But the whole nature of the word, which can mean almost anything depending on how you say it, fights the concept of standardization. It’s not so much a word as a sound indicating a state of mind. So she had to give in on that one, but we put in a note at the end of the book absolving her from all blame. With “Chrissie” I’ve also had the help of Eddie the Agent, who picked it apart twice, calling for rewrites and closer editing before he finally started pitching it to publishers. It also went through someone at his agency, who offered some trenchant observations that I adopted. Whether you use a critique group, hire an editor, or marry one (I recommend it!) having multiple sets of eyes on your final draft is important. There’s not much that ruins a book more than a host of typos and grammatical errors. Readers have to trust you. If they get a few chapters in and start thinking, “My eight-year-old writes better than this!” you’re in trouble. I was looking through the folder on my desktop that holds my MS for “Chrissie Warren: Pirate Hunter” and, as luck would have it, I came across a file from 2011 called “notes on Chrissie Warren final draft.” These were notes my agent – Eddie the Agent – sent me after he read what I then naively thought was the final draft of the book. It was, by my estimate, about the fourth draft and it had already changed quite a bit. What was so interesting to me was to see how much it has changed since then. Most of his notes were about tightening it up. Places where I could trim a sentence. Places where half a paragraph could be trimmed with no ill effect. Or where an explanation of some obvious point could be disposed of. And places where the story meandered off in a direction that just didn’t need to happen. Some action or thing that didn’t advance the story. For instance (spoiler alert!) when Chrissie’s ship arrives in Nevis, in the original version it took about three days before she and her friends left the ship. In the version that will go on sale soon, the ship arrives in port in the morning and they’re gone that night. I liked some of the stuff that used to be there, there were a couple of fun new characters introduced and a nice picture of shipboard life. But it dawdled – there’s no other words for it. The action didn’t go anywhere, the characters, while colorful, had nothing to do with the story. It dawdled. In the rewrites that followed – and I do remember bleeding over this for the better part of a week – I telescoped it from three days in five chapters to one day and one chapter. And “telescoped” is a polite word. I beat it, hacked at it, agonized over every word. The version I’m about to introduce to the world is almost 8,000 words shorter than the version Eddie the Agent commented on, about 10 percent. I knew that’s what I had to do to keep the pace up. Pace. The whole thing can’t go at breakneck speed (that’s one of my biggest problems with “The Da Vinci Code.” It would just be impossible to do all they did in such a little amount of time. Don’t they ever sleep? Go to the bathroom?) But you need to be aware of the pace. It has to build, then relax slightly, build more … Each jump in the pace raising the stakes a little more, like each wave reaching a little higher up the beach as the tide comes in. And then, once you really get going, it just becomes relentless. The original version of “Chrissie,” the very first bits of the first draft (which as near as I can tell no longer exist anywhere) was very, very different. The family was different. The situation different. And most importantly, it took forever for her to decide to go to sea, which is the turning point and needs to come in the first quarter of the story. There were some really nice scene in there. One scene – long gone – involved Chrissie walking to one of the big houses in Hampton, looking for a position on the kitchen staff. On the one hand, it really illustrated the conundrum she faced and the choice she had to make. I thought it was a well-written scene. On the other hand, it was too damn long and too much of a detour to the story. Who cares about the condition of scullery maids in 18th century Virginia? Just get to the damn pirates! Serve the story. That’s the only rule. Serve the story. Or, as Sir Arthur Quiller-Couch said, whenever you feel compelled to commit a particularly fine bit of writing, whenever you find yourself oohing and aahing over your prose, go ahead and give in to it. Write it, get it out of your system. Then, delete it. That’s what the rewrites are for. Or in Sir Arthur’s words, “Murder your darlings.” The best prose is something you don’t really notice. Good prose doesn’t exist for its own merits. That’s called showing off. It exists to move the story from your brain as directly as possible into the reader’s. The story is the only thing that matters. You, as the author, matter not at all. It was kind of fun looking back over that old version of the story, but I don’t regret the changes I’ve made. It’s better now. A better story. I think readers will like it a lot.